Giving the interior of your home a fresh coat of paint is one of the most popular and effective ways to freshen its appearance and increase your enjoyment of your home’s living areas. If you’re putting your home on the market, a fresh coat of paint throughout is a surefire way to improve its sell-ability. For landlords, interior painting is one of the best ways to make any home more attractive to new tenants. At our Twin Cities home maintenance service company, painting jobs are some of the most frequently requested services we offer. Top Quality Preparation – A high quality paint job requires proper preparation. Our skilled painters take great pains to prepare your surfaces before beginning the actual painting. From cleaning dirty walls and patching even the smallest holes and blemishes to making sure surfaces to be painted are smooth and even, careful preparation is the key. 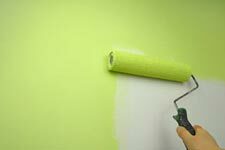 Careful Masking – One of the most common problems with DIY painting is paint bleeding. This produces uneven paint lines in corners, around woodwork, and where colors change. Expert masking, with the proper materials, eliminates those problems. We take great care with masking, and get great results. High Quality Materials – Choosing paint for your home is a crucial step in any painting job. Our expert painting professionals will help you make the right paint selection, to assure you of long-lasting, beautiful results. We can also match any color you select with high quality paints. Complete Protection of Your Home – Protecting all furniture, flooring, and other features in your home means spending as much time as needed to remove or completely cover them and to keep all paint where it is supposed to go and away from where it isn’t. Our painters are meticulously careful with your home. Professional Tools Mean Professional Results – Interior painting may require a wide variety of painting tools. The experienced painters from our trusted handyman service company use a full range professional grade painting tools throughout the job. You can see the difference. Professional Techniques Create Beautiful Rooms – Different surfaces and different textures require different techniques for a beautiful result. From flat walls to woodwork and trim, our painters use the exact painting techniques that get the results you want. Their long experience is their guide. Solving Special Painting Challenges – Our painters have solutions for every difficult painting challenge. From transforming popcorn ceilings to painting difficult surfaces like masonry and other highly textured materials, you’ll get great results from our experienced, creative painting specialists. Experience makes the difference. When you need high quality painting for your home’s interior, our Minneapolis St. Paul home service contractor is your source for experienced painters who will give you the beautiful results you demand. Careful, efficient, and highly affordable, our painters will transform your interior surfaces and bring new life to your home’s interior. From a single wall to an entire home, call us to discuss all of your painting needs. We’re always ready to provide you with maximum service at a great price.